David M Robinson (DMR) Jewellers in Liverpool ONE has achieved an outstanding mystery shopper report, making it number one, out of 128 stores, in the shopping complex for customer service. Based on South John Street, the store received an impressive 100% score, judging its external and internal appearance as well as the overall service the mystery shopper received. 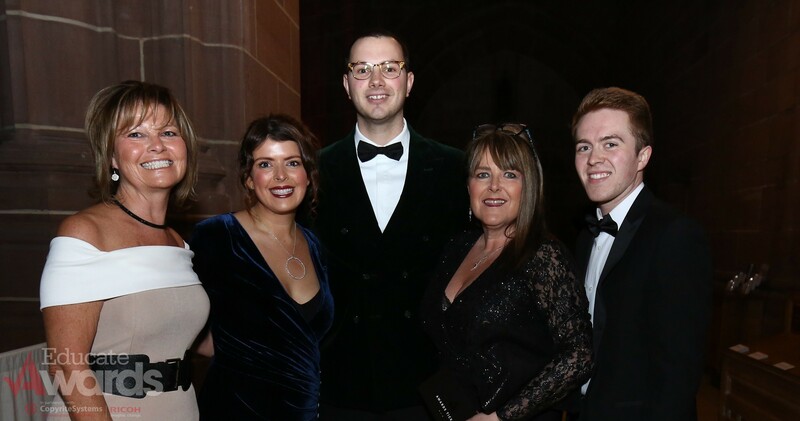 The DMR team at this year’s Educate Awards. The covert customer praised DMR’s staff for their warm and friendly welcome and for their incredible knowledge for each designer and product on offer in store. They found the overall service to be natural and sincere, taking particular interest in to what the shopper was looking to purchase and whether the item was a gift for a loved one or for themselves. Liverpool ONE arranges a programme of mystery shoppers annually to ensure the service levels are consistent across the estate. Established in 1969, DMR boasts over 40 years in the industry and two DeBeers Diamonds International Awards. “Designing beautiful things for people in love”, David M Robinson has further stores in Altrincham, Manchester, and Canary Wharf (London). DMR has supported the Educate Awards as a sponsor for the last two years, recognising the Outstanding Arts achievements of schools. For more information, visit: www.davidmrobinson.co.uk.